Industry type : Leather Industry. Experience - Minimum One Year. Must be fluent in English. Company Profile - Leather Manufacturing Company in Kolkata. Writing Quotation, raising Invoices, answering emails etc. Candidate should be fluent in English. Candidate should be excellent in English Correspondences. Candidate should be adept in MS Office, Internet, Emailing. Should be highly skilled in correspondence and MIS. Graduate or an MBA from any stream can apply. We do not arrange interviews if the candidate does not turns up to meet us to sign up the Declaration Papers. Please Note: We do not charge the registration fees. Interview Schedule: 12 P.M TO 5 P.M from Monday, Tuesday, Wednesday, Thursday, Friday or Saturday. BUS STOPPAGE: Lal Bazar - Bentinck Street. Nearest Metro: Both Chandni Chowk(North Gate) and Central (South Gate). Landmark: Beside Bentinck Street Bata Showroom in Lal Bazar (B.B.D.BAG), Grant Lane is Opposite to Mercantile Building in Bentinck Street. Ecomm is a Placement Consultancy. This is not a free Recruitment. Avail free Registration in our Consultancy. No advance fees till you draw the salary from the company. Get unlimited Interview Calls after signup of the form. Consulting Charges applicable only after you join the company. Opening for Export Executive in Gariahat in Manufacturing Co. 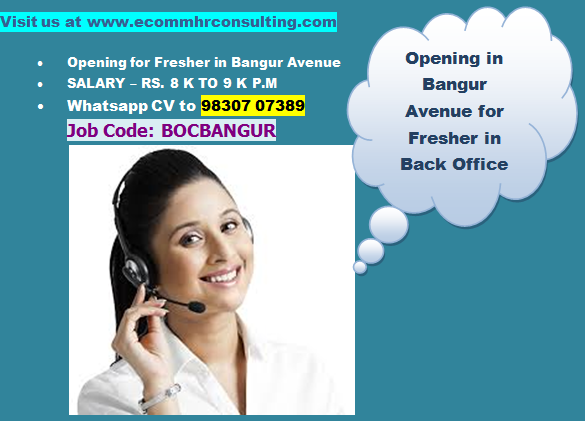 Opening for Back Office Executive in Park Street in Engineering Co. THANKS FOR STOPPING BY. Picture Window theme. Powered by Blogger.